The new research network aims to create the basis for quantum technology 2.0, which will give access to secure modes of communication, innovative information processing systems and highly sensitive detectors. By comparison with the picture provided by classical physics, the quantum world is extremely odd. In the latter, physical parameters such as energy or spin in objects like atoms or electrons can only carry certain values or energy states. In other words, these properties are quantized. Light and energy are not continuous quantities, but appear in discrete and tiny packets. The term ‘quantum’ generally refers to the smallest possible unit of energy. During the 20th century, these discoveries transformed our understanding of the world on the smallest scales, initiated a technological revolution that led to transistors and GPS, and forged the basis for modern information technologies. Although the realization of new applications will require further extensions of quantum information theory, much of our understanding of nature has already been recast within the framework of QIT. “Thanks to advances in information processing and insights from quantum mechanics, a new universal language has emerged that allows to describe the nature of black holes or the properties of condensed-matter systems in the same terms as we use to characterize quantum computers and quantum communication,” Bloch explains. The new Cluster will develop new theories and algorithms that should provide better approaches to computing with quanta. Theorists like Cluster Coordinator Ignacio Cirac will formulate new models, and design software for quantum computers and protocols for quantum communication, as well as new theorems to assess the security and efficiency of such protocols. “Not only that, the theory behind these computers and communication systems provides us with new perspectives on other fields of science, such as high-energy physics, cosmology and chemistry,” says Cirac. Central to QIT is the concept of entanglement, which underlies most of the phenomena and applications that are unique to quantum physics. Two or more atoms, electrons or photons are ‘entangled’ if the state of each particle cannot be described independent from the state of the other particles – for example, if one particle’s spin is dependent on that of the other. Hence, entangled particles no longer behave independently – and their properties remain correlated even when they are very far apart. “With respect to applications, entanglement is a tremendously valuable resource,” says Bloch. This is partly because entanglement increases the precision of measurements in proportion to the number of particles entangled with one another. On the other hand, the principle of entanglement is itself very difficult to comprehend, and it can take on highly complex forms. In fact, it remains a terrific challenge to characterize, classify and comprehend the entanglement of more than two particles. “The greater the number of particles involved, the more difficult it is to build and control entangled systems,” says Bloch. The Cluster will study entanglement in the context of condensed-matter systems, where it can give rise to new states of matter. Indeed, QIT may be particularly useful both in this context and in cosmology. “We basically know all the forces and quantum mechanical rules that determine how particles interact, but we do not know what sort of social behavior they engage in when they are together.” Here, ‘social behavior’ refers to the collective effects that are responsible for observable properties such as magnetism or superconductivity. Quantum optical experiments now make it possible to model phenomena in high-energy physics that have so far not been tackled with quantum-based approaches. Monika Aidelsburger, an early-career researcher at LMU, heads a research unit dedicated to Explorative Research Directions, together with Ulrich Schollwöck. Her goal is to simulate such phenomena by using systems of ultracold atoms trapped in optical lattices as analogs and, on this basis, develop new theoretical models to describe their origins. The MCQST is also very interested in attracting other young researchers who wish to put their own ideas into practice. For example, it offers START Fellowships to talented postdocs, which is designed to enable them to create their own groups. The huge potential of the fields to be investigated in the Cluster is further evidenced by plans for a new Master’s course in Quantum Science and Technology, which will be given jointly by LMU and TUM. “It will offer a unique and broadly based education in the field. These are important factors both for research and for industry,” Aidelsburger says. Research in these fields is highly dynamic. This also applies to data security in encrypted communication. Here, the Cluster will develop quantum repeaters, which are required to connect quantum memories into a functional network. It also plans to build a secure quantum link between LMU and MPQ, including interfaces for classical information technologies and possibly for satellite communication. As well as entanglement, quantum sensors can make use of synthetic atoms that respond to the tiniest alterations in quantum states. They can therefore measure changes in brain activity, magnetic fields or the concentration of gases with unprecedented sensitivity. In the area of quantum matter, researchers will explore ideas for novel materials such as two-dimensional superconductors. Perhaps the most ambitious goal of quantum physicists is to assemble and interlink modular quantum systems into a fully programmable quantum computer. “But there are many obstacles to be overcome before this dream can be realized,” says Gross. Error correction is one such obstacle, and the scalability of quantum systems is another. “It cannot be assumed that if a two-component system works, so will one that contains a million. This is not an engineering project, where one can follow a predetermined plan,” says Bloch. Here, he stresses the importance of disseminating research insights and issues to a wider audience. That is one reason why the Deutsche Museum is a partner in the Cluster. “We are determined to explain and illustrate the potential and the problems associated with the most exciting quantum technologies.” Planning is underway for a permanent exhibition on the topic at the museum, as well as other presentations designed for the general public. “It is possible to communicate enthusiasm at the same time as to explain the huge challenges that lie ahead,” he says. 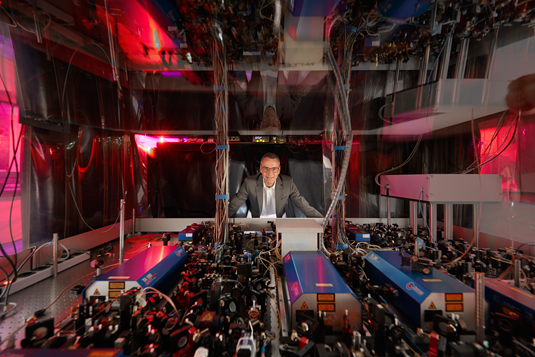 Munich Scientists, using high precision laser spectroscopy of atomic hydrogen, confirm the surprisingly small value of the proton radius determined from muonic hydrogen. Physicists have entangled two rubidium atoms at a distance of 400 metres and performed fast and efficient measurements of their spin states. Their study contradicts certain assumptions of classical physics. Scientists led by Professor Immanuel Bloch have developed a novel technique to let atoms interact over large distances. Immanuel Bloch uses batteries of lasers and sophisticated control circuitry to create artificial crystals with which he can simulate and study physical phenomena at the quantum level. LMU physicists have, for the first time, successfully transmitted a secure quantum code through the atmosphere from an aircraft to a ground station.